Want to know my little secret for livening up a space? Plants. Yes, they make everyone happy, bring in a little bit of nature, and always go with the decor. Right now, I'm really into oversized, leafy assortments like these. They're sculptural and powerful without being overbearing. Perfection. So next time you're feeling blah about your space, try picking up a bouquet of flowers, a cute little succulent, or a big leafy bunch. Mood lifted, guaranteed. Happy Friday, loves! Have a beautiful weekend! I love big leaf arrangements! Crystal, I don't have room for a lot of plants; however I have wanted a fiddle leaf palm for some time!! 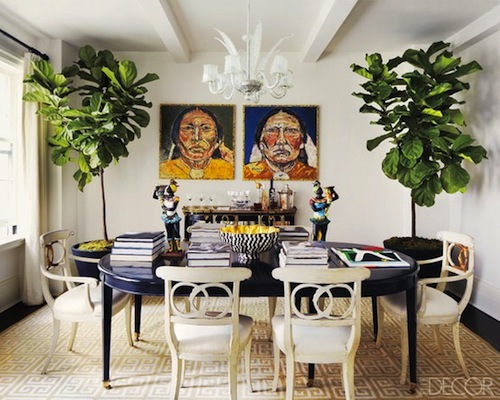 A plant brings such life to a room! I love it. I love the splash of yellow in the first room! long time reader of your blog btw! How cute is this? I think homes should only be built with hardwood floors. That will be my cause.